Please note that Ideapod may receive commission if you end up purchasing Grammarly Premium. You can always try the free version though – we’re happy to recommend it. We also shared our issues with Grammarly below. If you’re someone interested in improving your grammar, spelling and general writing skills, the chances are that you’ve come across Grammarly lately. 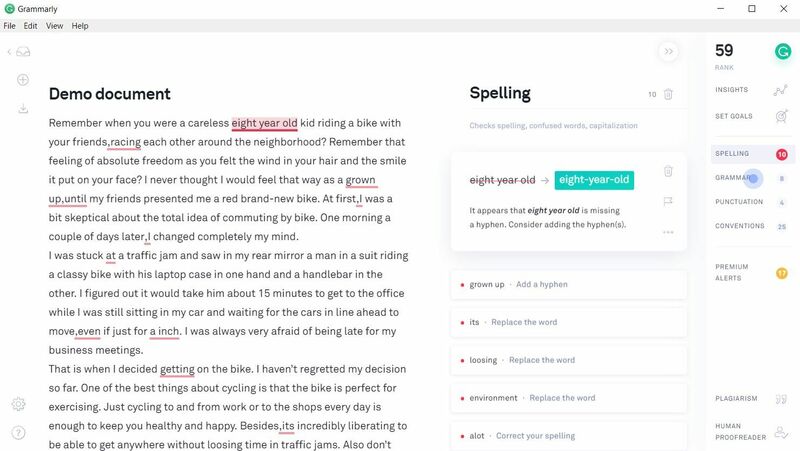 Described as a “free proofreading and editing tool”, Grammarly is a software program that flags mistakes and helps make sure your writing is clearer. But can Grammarly – which bills itself as the “world’s most accurate grammar checker” – really improve your writing? This is what I plan to help you find out in this comprehensive Grammarly review. To figure out the answer, I used Grammarly for 30 days and got to the bottom of exactly how Grammarly works. 5 How easy to use is Grammarly? 6 How much does Grammarly cost? 8 How does Grammarly compare to a human proofreader? 9 Who should use Grammarly? 13 Is the premium version worth it? I’m a good person to do this review. I’m the founder and editor-in-chief of Ideapod, an online magazine with millions of monthly readers. We’ve published thousands of articles, many of them submitted by writers and edited by me. I wish I had have come across Grammarly years ago. It would have saved me so much time. The free version of Grammarly is a no-brainer. It picks up on numerous errors not just by me, but also by our writers. However, it’s not perfect, and I’m going to explain why. Is the premium version of Grammarly worth it? I’ll answer that question, and will share everything good, bad and ugly about Grammarly (along with screenships and extra tips). The first thing to do is to go to Grammarly and create a free account. Once you create your free Grammarly account, you’ll be taken on a tour of the Grammarly editor. It quickly helps you adjust the settings so the feedback you get is relevant to your writing goals. After the tour, create a new document and paste your writing in here. You then tell Grammarly the context of your writing, which changes the suggestions they make. Indicating intent is very useful as it changes the nature of the suggestions made. After this, you’ll be shown where changes should be made, as you can see below. Click on the words underlined in text and you’ll see their recommended changes. You can toggle between “spelling”, “grammar”, “punctuation” and “conventions” on the right-hand side. You have a few different ways to use the tool to check your work. You can copy and paste the entire contents of your written work into Grammarly for proofreading, grammar checking and spell checking. You can import a document directly from Microsoft Word (or other word processors). You can use it as your writing app, writing directly into the tool. It will point out errors as you go. Windows users can install a plugin directly into Microsoft Word so that Grammarly checks your writing as you write. Unfortunately, it’s not available for MS Word on the Mac. Personally, I found the best way to use Grammarly was to paste article drafts into a new document so I could quickly work through the suggested changes (option 1 above). But I also used the Grammarly extension. There’s a nifty feature I discovered while using Grammarly. You can install the browser extension. 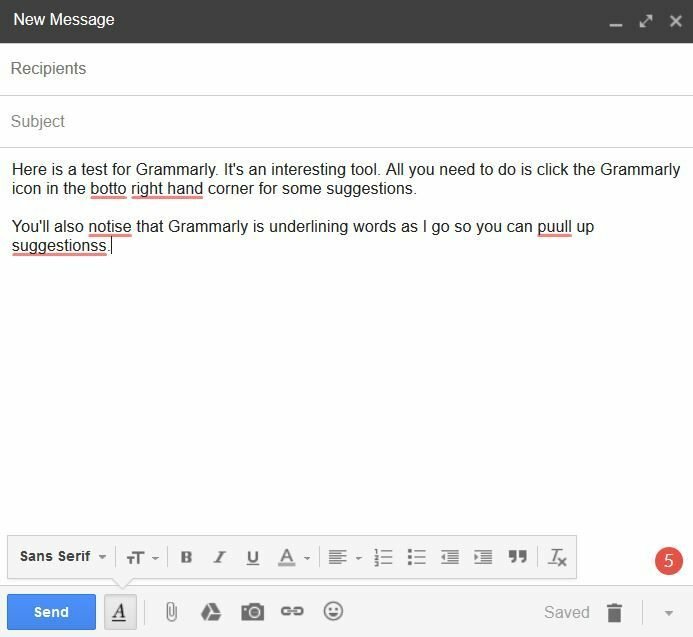 This means that Grammarly will show suggestions while you’re using the web. The browser extension can be installed as part of the free version. For example, Grammarly automatically checked my text while I was typing an email, as you can see below. This happens anywhere there is a place to input text. It’s a useful addition to the free version of Grammarly and importantly doesn’t get in the way of your browsing experience. How easy to use is Grammarly? I’ve used many different software applications to improve how I write for Ideapod. Grammarly is by far the easiest to use. Installing the software onto my PC was trouble free. It took only a few clicks to add the browser extension (in my case to Firefox). Once it’s installed, there’s not much more to do. I love how Grammarly works in the background checking everything I’m writing. Check out my articles on Ideapod. I think you’ll be hard pressed to find grammatical errors (let me know in the comments if you do!). As I mentioned above, as someone who writes regularly and edits the work of others, I’ve found the free version of Grammarly to be very useful. In fact, the free version may be sufficient for your needs. However, I decided to try Grammarly Premium to see the benefits for myself. How does Grammarly compare to a human proofreader? In researching this article, I reached out to Brendan Brown from The Expert Editor. They’re Australia’s leading professional proofreading and editing company. They also edit all of Ideapod’s eBooks and longer articles. This makes sense to me. I’m using Grammarly for my emails and articles, but I’ll keep on using The Expert Editor for the eBooks and longer articles we’re writing. NOTE: Brendan Brown just wrote his own review of Grammarly. Check it out here. I think Grammarly is useful to just about anyone working in a professional capacity. Whether it’s emails you’re sending or documents you’re writing, the tools will help to ensure what you send out or publish is error-free. I would particularly recommend it to non-native English speakers. When you’re a non-native English speaker, no matter how advanced you are, errors creep into your writing. Whenever articles are submitted to Ideapod by non-native English speakers, it takes more work for us to edit them. The quality of the content is of course just the same, but it takes longer to get the article ready for publication. Grammarly is hands-down the most effective tool to remove the majority of these errors. Professionals who wish to create grammatically accurate emails, presentations, or social media posts. Digital company owners, moderators, and any individual who wants to check content for plagiarism. Some of the most advanced features of Grammarly are part of their premium package. You should consider this if you’re really serious about creating fool-proof content. 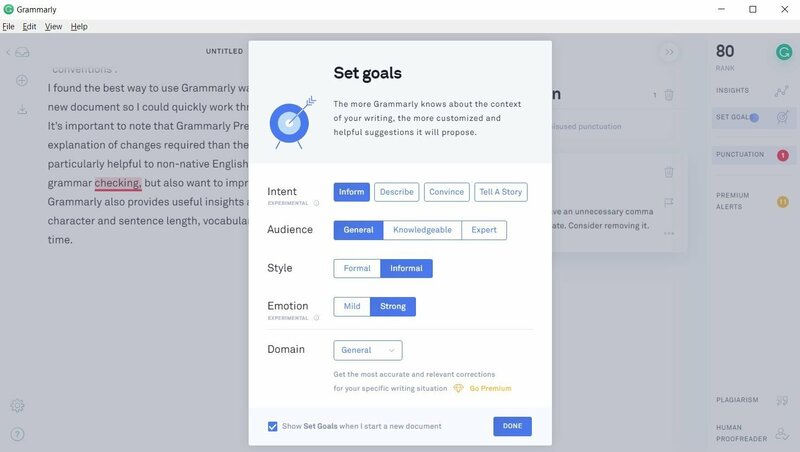 These new features, among others, will allow you to create a more intricate proofreading basis whenever you’re using Grammarly. Grammarly’s versatility in working alongside other platforms is one other perk that I like. And this is something you will find particularly useful if your work involves using different kinds of software. Furthermore, it works wherever you are. You can use it as a desktop application or as an extension on your browser, which is great if you’re constantly writing emails. Grammarly is also available as a mobile app. The keyword app allows Grammarly to instantly correct whatever you type on your phone. If you do most of your business correspondences or other work-related writing on your mobile phone, you can now say goodbye to basic grammatical errors. Last year, Grammarly released a number of new features with an aim of improving user experience. You can now set writing goals and check valuable writing insights. 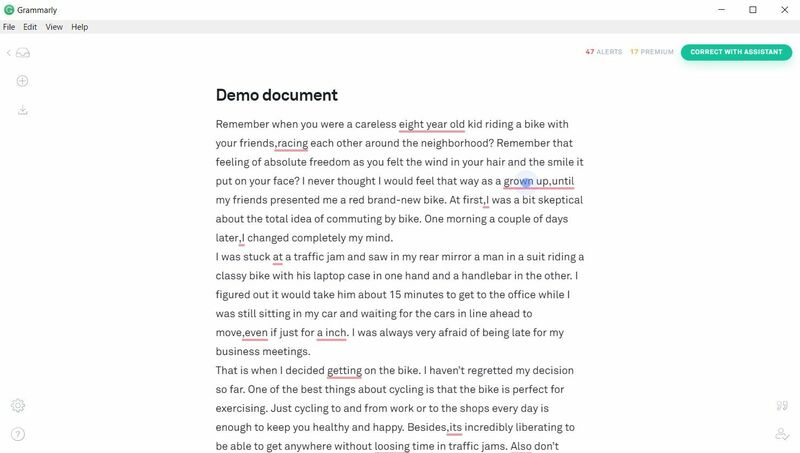 Grammarly has also recently released a new software installment, called Grammarly Business Version. 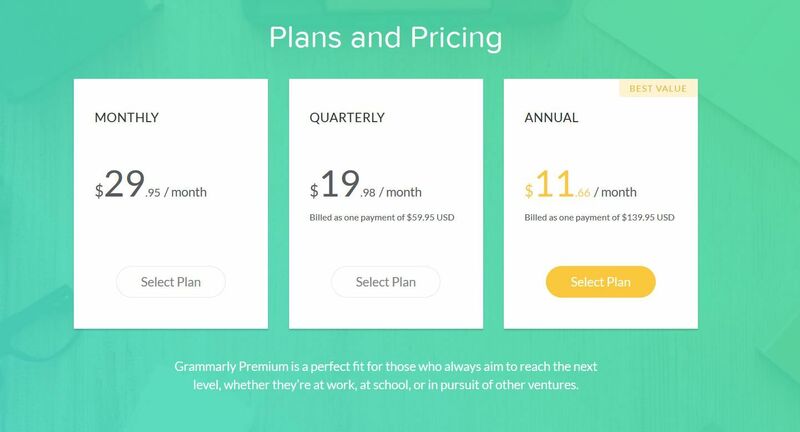 This business version provides the same unique and comprehensive features as Grammarly Premium. However, it is much more tailored to business-owners, mainly that it is not limited to a single platform. Admin console to manage each subscription and monitor their activity and engagement trend. As much as I’ve found Grammarly to be a useful addition to my process of writing, I’ve encountered some challenges using the software. The first issue is that the Grammarly browser extension slows down my typing when using the web browser. I’m a pretty fast typer at around 80 words per minute, and I’ve got a decent computer with a fast processor (to handle my video editing). Yet when I type, Grammarly is checking every word for errors. The result is that some letters don’t make it to the screen, resulting in more errors for me to correct afterward. To get around this, I’m going to switch off the browser extension and instead use the PC software program, pasting my drafts directly into a new document to check for errors. Ideally, I would have liked to keep on using the browser extension without needing to go through this extra step of pasting my articles into the software program. The second issue is the aggressiveness with which Grammarly prompts you to upgrade from the free version to Grammarly Premium. There are always options to click through to the premium version as well as regular emails prompting me to upgrade. There is nothing that can beat human proofreaders. And only humans can definitively understand the context of what you are trying to write. But would you use something that gets rid of all the annoying common grammar mistakes? Yes, definitely. This is why the free version is great. The question is, would the premium version even be better? I believe the answer is yes. The premium version offers a whole lot of features that would absolutely help you save time and make your writer grammatically better. It’s a reliable tool that will help you micromanage the basic parts of writing once you get a handle of the program. 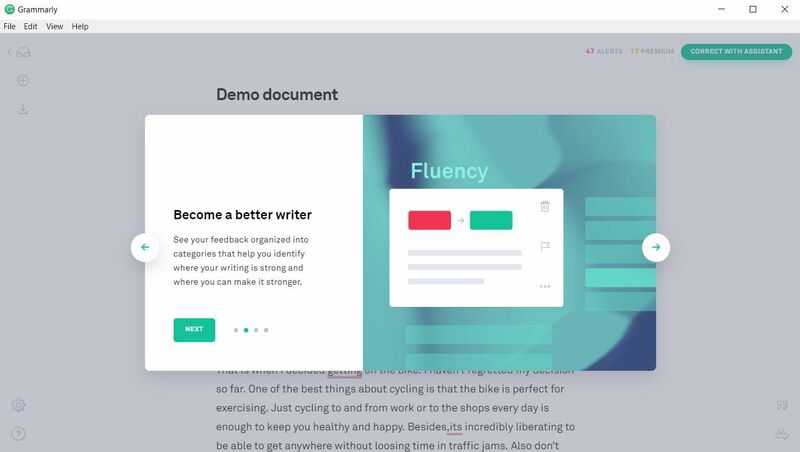 Grammarly claims that the program for the premium version was “built by linguists and language lovers.” It is capable of checking 400+ complex grammatical errors, so you wouldn’t have to. Advanced checks for punctuation, grammar, context, and sentence structure. I find that this is particularly useful for creating easy-to-read content. Vocabulary enhancement suggestions. This feature is perfect in avoiding repeated synonyms. Genre-specific writing style checks. Of course, nothing beats a human editor when it comes to this. However, I find this feature is an added bonus that adds a bit more to my writing. Plagiarism detector that checks more than 16 billion web pages. This is perhaps one of the most valuable features of Grammarly premium. It’s like having an editor and a built-in Copyscape at the same time. See explanations of grammar rules. An added learning tool. When you’ve been writing as I have, it’s easy to think you know everything about Grammar that you need to know. But we will always be prone to mistakes, and there are things we tend to forget or rules we haven’t learned. So this feature can be particularly useful to anyone from beginner to expert. See definitions and synonyms via double clicks. Just like the grammar rules explanation, this is also a neat little feature that can elevate anyone’s writing. There’s no denying that the free version is great on its own. However, the premium version simply gives you more. If you’re serious about creating content that is grammatically spotless, then it’s the version is for you. Grammarly Premium gives detailed information about each grammar mistake you commit, so it’s also a learning tool for you to avoid the same mistakes in the future. You can also set your very own writing goals. Additionally, the paid version provides more writing insights and allows you to find and fix significantly more mistakes compared to the free version. You’ll find thousands of articles here on Ideapod, many of which I’ve written. We also have paid writers submitting work to me on a regular basis. As a professional writer, I have found the additional suggestions provided by Grammarly Premium to be extraordinarily useful. I’m especially going to continue using Grammarly Premium for the content submitted by writers. It’s provided a number of useful suggestions, and the insights help me to evaluate the quality of writers. Although Ideapod writers never plagiarize material, running their articles through the plagiarism detector provides some additional comfort. If you’re looking for a simple solution to immediately increase the quality of your writing (or other people’s writing that you’re editing), you’ll appreciate the advanced checks for punctuation, grammar, context and sentence structure. The vocabulary enhancements and genre-specific writing style checks also will give your work some extra flourish. It’s important to note that Grammarly Premium provides a more detailed explanation of changes required than in the free version. This would be particularly helpful to non-native English speakers who don’t just want their grammar checked, but also want to improve their English. Grammarly also provides useful insights about your writing based on character and sentence length, vocabulary and readability, and reading time. I think the best thing to do is sign up for the free version of Grammarly and evaluate how useful it is to you. Grammarly will show you the benefits of the premium version while you’re using the free version, so you can always decide later. Here’s where you can find out more about Grammarly Premium. Overall, I highly recommend the Grammarly to most people. So many people underestimate the importance of editing their work. We’re becoming more reliant on email over time, and having a professional editing tool checking everything before it goes out is a fantastic way to improve your professionalism. I think Grammarly is particularly useful to non-native English speakers, and they would get the most value out of Grammarly Premium. However, I wouldn’t recommend Grammarly as a substitute for getting your books or similar manuscripts edited by a professional human editor. Grammarly may misinterpret the context. Finally, it’s worth noting that this article was edited by Grammarly. Have you found any errors? Grammarly helped me fix 11 errors, and 1 error still remains which I decided didn’t need to be fixed. Can you find it? You can sign up for the free version of Grammarly by clicking here. I approve. Grammarly has been in my tool set over two years now and use it for all my writing efforts. Do not think too long, your grammar errors will accumulate. As those sneaker people tell us, just do it.